Community Land Scotland maintaining its reputation as the sunniest conference! Friday 18th May saw 100+ individuals, passionate about Community Land Ownership travel from all over the country to Stirling for the annual Community Land Scotland Conference. The theme of this year’s conference was “What can we learn from Community Land Owners?”. The answer predicted in Ian Hepburn’s welcome was “quite a lot”. A prediction that would turn out to be quite accurate! The keynote speech was delivered by Roseanna Cunningham MSP, Cabinet Secretary for Environment, Climate Change and Land Reform. The message was that the continuing growth of Community Land Ownership should be celebrated and supported and that community land isn’t just for the Highlands and Islands but all areas of Scotland. Furthermore, Land Reform needs to be understood as being part of a bigger picture; strengthening Scotland’s communities. This involves cross-sector and cross-policy collaboration involving Land Reform, Planning, Housing, the Islands Bill and many more. Following the keynote speech were presentations from Anne Fraser, Garbh Allt Community Initiative, and Professor Jim Hunter and Dr Calum MacLeod from Community Land Scotland. The first afternoon concluded with workshops on: reaching one million acres in community land ownership; Crown Estate Scotland’s assets and opportunities; CRtB Abandoned and; Neglected Land and celebrating our community land culture. Day two of the conference was no less interesting or inspiring. Following the welcome back from Angela Williams, the delegates heard from Rebecca Munro; a resident’s perspective of the CRtB of the Island of Ulva. Rebecca stressed that it is hard work, it can be intrusive on your day to day life but that communities involved in the process need to carry on. At the end, you can find yourself in their position; the community owning their home. 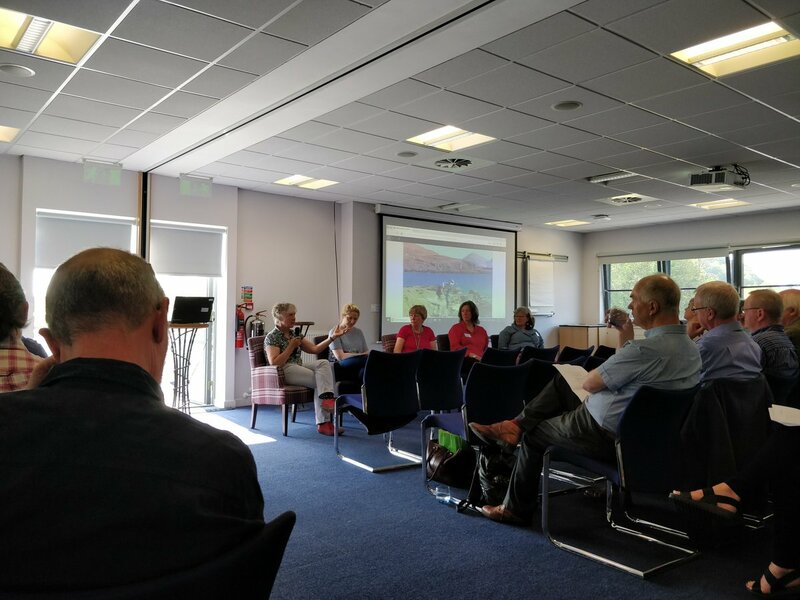 The morning session ended with a panel discussion on Land and Culture chaired by Agnes Rennie (Urras Oighreachd Ghabhsainn) with: Mairi McFadyen (Abriachan Forest Trust); Polly MacInness (Sleat Community Trust); Dr Issie MacPhail (UHI) and; Lucy Conway (Isle of Eigg Heritage Trust). The afternoon workshops gave the opportunity for delegates to take part in a theme from the previous day or join in a few new conversations: Resettlement and repopulation in rural Scotland; Engaging young adults in community land management; How community landowners can share knowledge and; Urban community land opportunities and challenges. As always, a fantastic event that stimulates many ideas, discussions and questions. 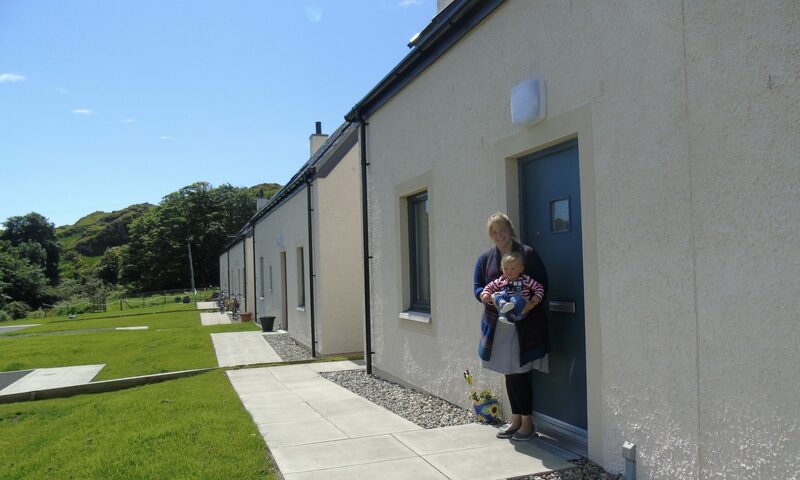 Our interest, of course, is how community land ownership can help facilitate the delivery of genuinely affordable, suitable and desirable homes in rural Scotland. From the many conversations we had over the two days, it is clear that those who are passionate about their communities owning their land are equally as passionate about their communities having the housing they need. Amazingly, thanks to Alasdair Satchel from North West Community Woodlands Company, audio recordings of the presentations are available. A fantastic opportunity if you couldn’t make the conference or you want to hear the stars of the show again! Over the past couple of weeks, we’ve been busy getting out and having conversations with new contacts and having new conversations with old contacts. As you will be aware, Rural Housing Scotland recently announced that we will have a dedicated set of feet on the ground to cover the West Coast from Lochaber to Campbeltown. We are delighted to have received enquiries from all over the new geography! Over a couple of days we travelled to meet with North Ayrshire Council and Argyll and Bute Council to have a chat about Affordable Housing in Rural Scotland. 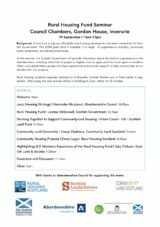 The meetings were really positive and it is genuinely heartening to see both councils understanding the difficulties in delivering small scale, truly affordable housing in rural Scotland and the Islands but that the delivery of this housing is absolutely vital to the social wellbeing, local economy, sustainability and future of our communities. We are looking forward to continuing to help facilitate communities, their local authority, RSLs and any and every other interested organisation in working together to help deliver housing where it may be needed but not understood or identified. 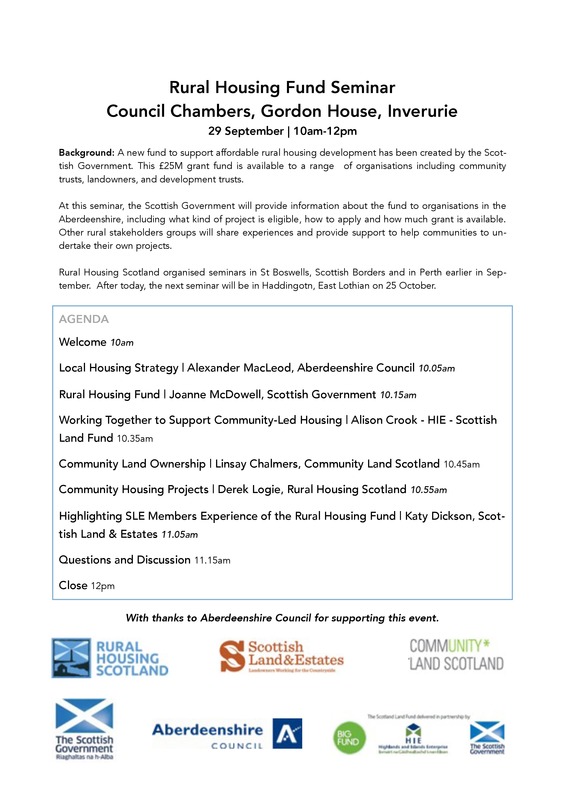 Often, access to land can be a barrier and so we are really looking forward to hearing more about Community Landownership in Stirling on the 18th/19th May at the annual Community Land Scotland Conference. If you see us at our stand or wandering around, come have a chat! Rural Housing Scotland visited the Island of Jura on Saturday 28th April to attend the Jura Development Trust’s Community Action Plan (CAP) event. That it had to be rescheduled due to some rather awful weather in March definitely ended up being a positive. We were treated to some unbelievable weather, the DT were able to develop an even stronger understanding of how the CAP can help map a clearer route towards the community’s “Dream Jura” and it also coincided with the election of a new Jura Community Council. Following the trip from Tayvallich to Craighouse, we had a round table discussion (and lunch) with the Jura DT, Cllr Anne Horn and the Development Trusts Association Scotland (DTAS). The CAP launch event was very well attended – especially considering how good the weather was – with attendees receiving an explanation of the process taken to create the CAP and how it will be used, a talk from Sandy Brunton (DTAS and Mull and Iona Community Trust) about his experiences of community development and a brief explanation from ourselves on how communities can influence the delivery of affordable housing in their area. Following the presentations, the all important tea, coffee and “CAP Cakes” were brought out which is always an effective method of encouraging discussion! The more informal discussion held will hopefully help spread awareness of the CAP, how the Jura DT hope to progress projects and that there are organisations who’s very purpose is to help communities build the future they want. The rest of the day was spent taking a stroll along the Corran Sands path, playing a tune on the ‘Bat Phone’ installation and then off to the hotel for dinner. Safe to say that the local malt was sampled which may have resulted in the impromptu music and singing. However, this is often when some of the most intriguing conversations are held; when folk are a bit more ‘relaxed’. By the time we were getting on the RIB back to Tayvallich, only 24hrs after arrival, it was evidently clear that there is a buzz on Jura about its future. A large part of that future will involve a bit of out-the-box thinking on how the community can deliver the affordable housing that will help it continue to grow. We’re keen to make ourselves as accessible as possible so that as many communities, individuals and organisations can approach us with any comments, questions, queries and proposals relating to affordable housing. However you want to contact us, just click on the relevant link below! What do Lochaber, Argyll and Arran have in Common? Answer: From the 1st of April 2018 they will all have a Rural Housing Scotland Development Officer they can call on for advice and assistance should they consider investigating affordable housing in their communities. Through the Our Island Home project, RHS has been working with various island communities in Argyll and Highlands and we are looking forward to extending our coverage into the Argyll mainland and Lochaber as well as welcoming Arran into the islands we cover. If your community is within our new area, feel free to get in touch to discuss any comments, questions or concerns you may have about affordable housing. Whilst I’m not under 3ft of snow like in other areas, it is still pretty darned cold so what better way to warm the cockles than getting stuck into this website administering show! Having never tried this before, it’s very much a case of learn as you go and so there *might* be a few teething issues. Nothing ventured, nothing gained though. So far it’s mainly been the RHS website and not the OIH page that’s been in receipt of some TLC. However, most contact details should now be up to date and I’ve also had the pleasure of trawling through various council’s Local Development Plans and Local Housing Strategies to update all of those links in the Policy section. Feel free to explore those delights!